My sister, who got married this past summer, moved into her first little abode with her husband and his navy blue sofa. She's not in love with the sofa or the color, but it's comfy and not something that they need to replace right now. 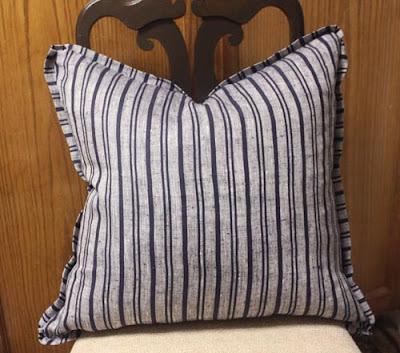 I'm a firm believer that most sofas look better with accent pillows, so for her Christmas present I did a little fabric shopping and decided I was going to sew 2 custom pillows for her. The thought crossed my mind several times to just have my upholstery guy sew them for me (much quicker and much more precise), but I decided I wanted to work on my sewing skills a little more, so I did it myself. Originally they were going to have a zipper, but due to time constraints and my lack of a "zipper foot" for the sewing machine, I just sewed in my feather inserts on all sides. 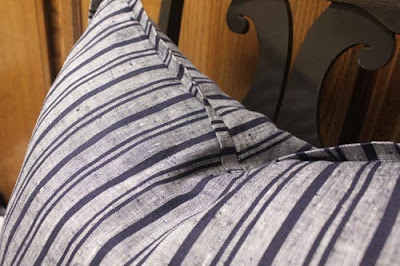 The pillows are far from perfect...crooked seams, uneven trim, etc., but luckily you can't see any of that in the photos! I was reminded once again that I am much more of a designer than a seamstress, but all in all, I think they turned out pretty cute. They are perfect. And Brian loves them too! Thanks sister, you really are a woman of many talents.